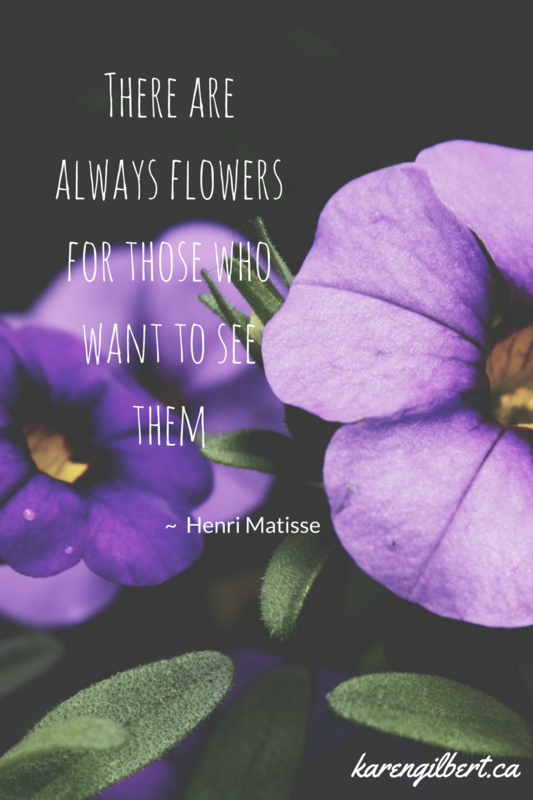 Welcome to the first post in a new series I am excited to share with you. 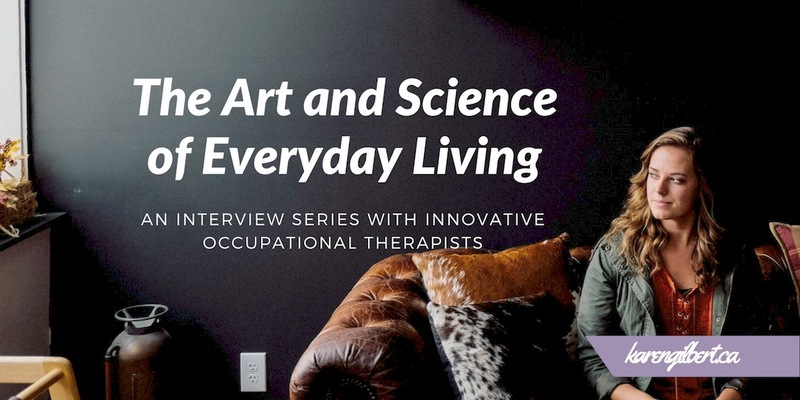 “The Art and Science of Everyday Living: an interview series with innovative occupational therapists”. Our first conversation is about a topic that impacts more than 1 in 5 people globally: chronic pain. If you have an invisible health condition like chronic pain, you may find pieces of your own story reflected in the words of the occupational therapists interviewed in this series. You may even find a tip or two to help you live your life with more ease, joy and meaning and foster a renewed sense of hope. 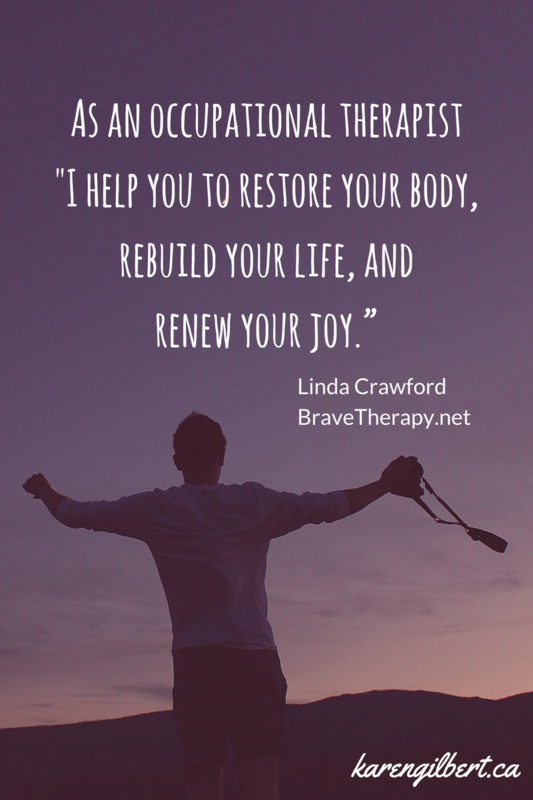 Linda Crawford is an occupational therapist specializing in chronic pain rehabilitation. She is a pain educator, certified facilitator of Brené Brown’s Daring Way™ shame resilience curriculum, and a former chronic pain sufferer. I first met Linda Crawford at The Daring Way™ national training in San Antonio in 2014 and how fortunate I was. 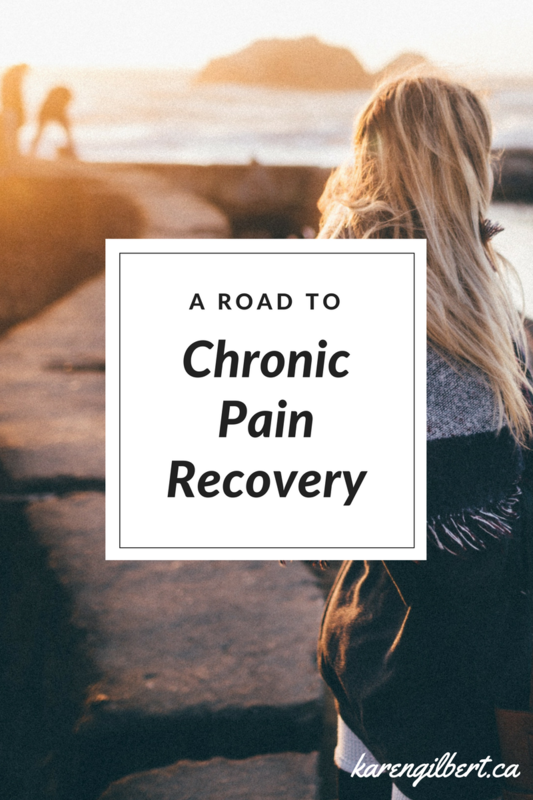 I continue to learn from her wealth of knowledge, wisdom, and commitment to applying the latest evidence for chronic pain and practices for wholehearted living. I’m so grateful to have her as our first OT in this series. Grief over the loss of roles, relationships, social connections, and physical abilities. Shame of not being able to do/be/feel/live like they would like or expect of themselves, and also shame from experiences with medical and non-medical people who fail to offer empathy and contribute to feelings of failure and being judged or misunderstood. Despair after trying to “do everything right” and failing to get better. I’ve found that recognizing and providing emotional support is critical for achieving a trusting and safe therapeutic relationship that allows me as an OT to empathically guide the therapy process forward to help people meet their goals. Give yourself permission to feel—cry/rant whatever—and go through it. Give yourself permission to listen to your body and take care of yourself. Give yourself permission to ask for help. Give yourself permission to slow down and give your body the time it needs to heal. Give yourself permission to say no, speak your truth, and own your own healing process. Give yourself permission to be afraid and brave at the same time. 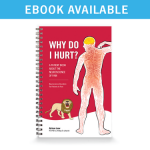 Most recommended book for clients with chronic pain for education in the bio-psycho-social science of chronic pain is “Why Do I Hurt” by Adriaan Louw. Most recommended resource for developing shame/pain resilience for the psycho-social aspects of chronic pain is “Rising Strong” by Brené Brown. Most recommended online resource for the development of self-compassion and self-care skills is Self-Compassion.org by Kristin Neff. I always get comments about how great it is that I try to look at the whole picture of who they are and how they want to live their life. They appreciate how we work together to create a therapy plan that works for them as an individual instead of me just telling them what to do. I am most excited about the pain research into the psycho-social aspects of chronic pain which is indicating that addressing these aspects has far greater impact on healing from chronic pain than addressing the physical aspects. Integrating psycho-social interventions with the physical is where OT’s are uniquely qualified as biopsychosocially trained health care professionals to make an impact. In my opinion, science is confirming over and over now what we as OT’s have always known . . . we must be patient centered, holistic, biopsychosocial practitioners to facilitate the best healing outcomes for our clients. I hope this research will continue to validate the value of OT and offer further insights into how I can best help my clients. I can’t imagine how my life has not been influenced by becoming an OT. I went back to college at 26 to complete my OT degree after discovering I was personally wilting working in the business world. Everything about the OT philosophy of fostering a whole-hearted, whole-life, whole-person approach to achieving health and well-being resonated with me. The rhythms that guide the very heartbeats of my life come from OT. I live everyday what I share with my clients. OT fosters inspiration, compassion, creativity, curiosity, courage and joy—in myself as well as the people I am privileged to work with. OT has helped me grow and bloom! So I cultivate and collect flowers to bring me meaning, joy, restoration, and health! I also love to write, play piano (just for my own pleasure), exercise, hike, travel (a lot), help plan events and celebrations, attend concerts and listen to music, do small home remodeling projects, and I’m working on transitioning cooking from a chore to a restore! Sitting with my furry, big fat, black, lovable cat on my lap. Still to happen – Dancing lessons with my hubby! One of the many checked off – sang “The Hills are Alive” (while spinning foolishly with arms open wide of course) on a mountainside in Austria! Be kind to yourself, healing is hard work. Find your tribe of caring, compassionate people who will support you in your goals for your healing. Take ownership of your own health and live brave by daring to speak your truth, asking for help, courageously tackling the tough stuff, and persistently pursuing your healing in the slow lane to success. 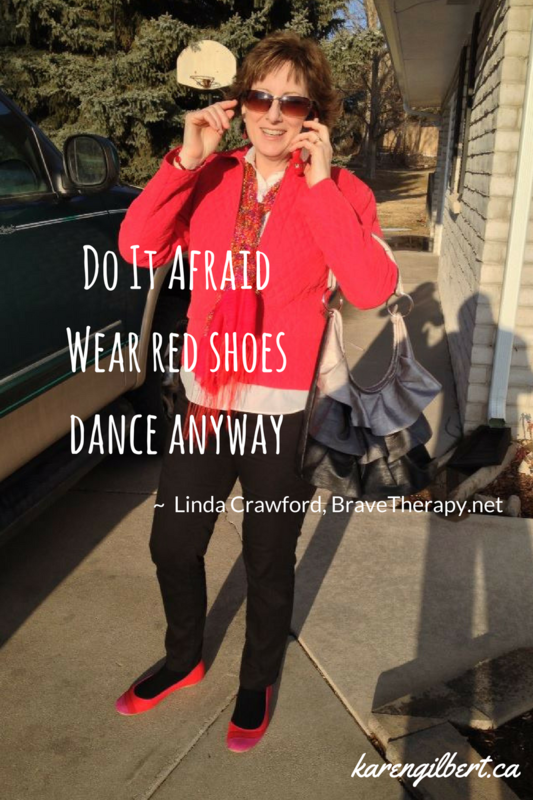 Linda Crawford, OTR/L, CDWF, owns a private practice specializing in pain rehabilitation, Bravetherapy.net, in Denver, CO. She is a former chronic pain sufferer, pain educator, and certified facilitator of Brené Brown’s Daring Way™ shame resilience curriculum. 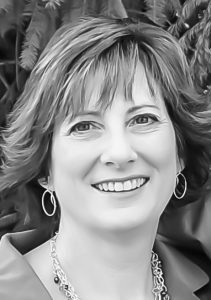 As a practicing clinician she has worked in acute, rehabilitation, long term care, and community settings, spending much of her career specializing in brain injury and stroke rehabilitation. She is currently developing a day long course for OT’s about novel strategies for treating chronic pain. Stay tuned!